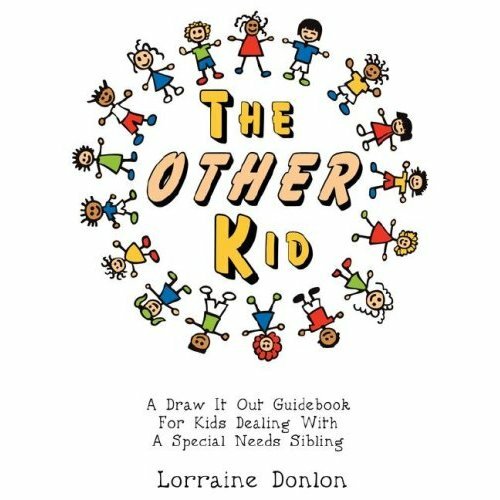 The Other Kid written by Lorraine Donlon is a draw it out guidebook/journal for children dealing with a special needs sibling. Written in clear and simple language, The Other Kid is an excellent learning tool for parents, grandparents, educators, special education service providers and social workers. Targeted for children between five and twelve years old, The Other Kid, validates the complex feelings of being the sibling to a brother or sister with special needs. 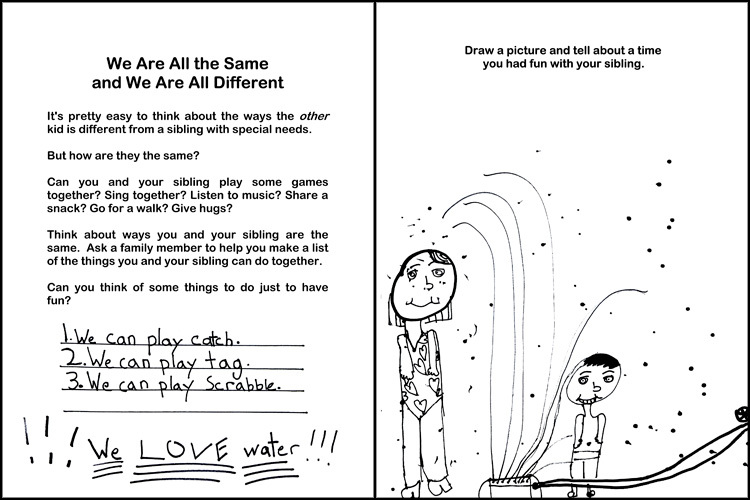 It encourages siblings to express their feelings through art and writing. The Other Kid also allows siblings to appreciate their brother/sister, to respect and accept their strengths as well as their weaknesses. It also highlights the similarities between siblings. More importantly, The Other Kid is the beginning of an honest conversation. While The Boy is an only child, I would highly recommend this book to parents with multiple children. I also believe that this book should be added to every school library and/or used with sibling support groups. It's important that children understand their feelings. The Other Kid supports awareness and acceptance. 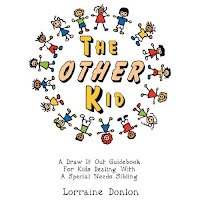 The sibling of sisters with special needs, Donlon wrote this book from her own experience. Born in 1959, Donlon was considered "lucky" to be "normal." However, she admits that she "didn't feel lucky" and often felt "guilty" for being a typically developing child while her sisters were "very low functioning" and "mostly non-verbal." Donlon shared that she "created The Other Kid as a coloring book because I wanted very small children to know that all the feelings they were experiencing were nothing to be ashamed of - and actually a very normal response to a very stressful situation. Letting kids have a place to draw and talk about what they are feeling also gives caring parents insights into what "the other kid" is feeling so concerns can be addressed in a loving and supportive way." Donlon's advice to parents: Find a way to have "alone" time with the typically developing child. Kids with special needs demand a lot of time, energy, and resources. It's important to remember that the typically developing kids need attention too - special 1:1 time where they can just be kids and feel important. Donlon's advice to "The Other Kids": It's OK to need your parents too. It's OK to have really strong feelings - both positive and negative - and that there are caring adults who will listen. It's also important for kids to know they are not alone - and can feel very reassured when they realize other siblings have felt the same way. The Other Kid is available on Amazon for $10.95 in English and Spanish (El Otro Nino). Leave a comment for this blog post - also specify if you want English or Spanish edition. 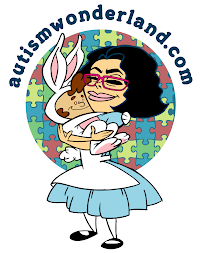 Send me an email at autismwonderland@gmail.com. (Even if you think I have it) If you DO NOT send me an email, I will NOT be able to contact you if you win. In your email, let me know you've left a comment and specify whether you want the English or Spanish edition. In order to qualify for contest you MUST complete steps 1 and 2. **Will only ship within the United States. Shipping is free of charge. Note: A complimentary copy of this book was provided to me by the author. The opinions expressed in this post are my own. I often wonder how my 2 year old will feel as he grows and starts to understand the differences between him and his 10 yr old brother. Lisa, I have been meaning to read this book forever. Thank you for the reminder. My two "neurotypical" girls,are beginning to act more "special" as they compete with the Aspie brother for center stage. The timing could not have been better for this read! Hi Lisa, This book sounds amazing! I would love to enter to win a copy! It would benefit our family in understanding and helping my 10yr. old nephew, Trent who suffers with a mild form of Autism and feels so left out and "hates" his life sometimes. I'd want the book in English, please and thank you! This review of this book is fantastic! I wish I'd have had such a book shared with me and my siblings. I am the older sister of a brother who had special needs (born with spina bifida). I know this would have helped me and my younger siblings deal with our feelings toward our brother much better. I just sent you an email, as step #2! I've added this fabulous book giveaway to my B-Y-G-B Book Giveaway linky list! Letting you know I voted for you on PicketFenceBlogs.com! And, by the way, that's where I found this book giveaway. And, I'm on the fence, too! I giveaway every book I win online. I can only understand the book in English. Thanks for this review and for the giveaway. This would be such a cool book to read. My husband and I are just beginning to recognize how our son's unique neurodevelopment affects his sister.